While we’re tucking this image nicely away in the rumor category given all the supposed Galaxy S III images we’ve seen over the past few days, it’s being given the official crown thanks to an overseas tech blog. The folks at GSMHelpDesk believe they have gotten their hands on an official looking press photo along with some “concrete” specs on the Galaxy S III. Accompanying the image are specs close to what we’ve already heard before: a 4.7″ Super AMOLED Plus HD display with 720p resolution and 313ppi, 12-megapixel camera with 1080p 60fps video recording with some special features like slow motion and time-lapse included. That quad-core processor we just heard about? Yup, that’s included as well at 1.5GHz (Exynos?) along with 1GB of RAM, 32GB’s of internal storage and a 1750mAh battery. The overall thickness of the phone is said to be 8mm. One thing to note as the boys from PocketNow have pointed, the bottom part of the phone in the image only shows three capacitive buttons, which could indicate a faked image or just a bad render. Another questionable part of the image lies in the older version of TouchWiz running, while a previously (faked) leaked photo was shown with the newest version of TouchWiz. Now to throw a little another twist into this story thanks to Samsung China Chief Executive Kim Young-ha who told reporters that the Galaxy S III could be released in April, instead of May. Given that we’ve heard Samsung hopes to launch the phone simultaneously around the world, we’ve got hope that the US and T-Mobile in general will be a part of that first wave of Galaxy S III launches. ← Angry Birds Space + T-Mobile + Walmart = ????? Quit lookin in the mirror! Lol :)….good one Tbyrne…he asked for it. Wow you speak sheeple to Tbyrne as well??? I should have known… makes complete sense by the way you distort reality to make yourself feel better about a cellphone service provider. Aww man, unpacked event on the 22nd?! But that falls on a Taco Tuesday!!!! I would actually like the two tone there. I’m a bit over every phone being dark gray or black. I loved my plum mt4g. The calendar is showing Tuesday May 22nd. what calendar? Im due for an upgrade don’t know if to wait??? Battery is 1750mAh? With a quad-core processor? WTF!!!!!!!!!!!!!! It would die after like 1 hour!!! Isn’t it supposed to be more battery efficient though? The screen doesn’t run on fresh air sir.Samsung would be idiots to put a sub 2000Mah battery in a quad core, let alone a dual core. I’m not arguing it needing a bigger battery but saying that the Quad-Core chip is supposed to be more fuel efficient. With that kind of power savings, I wouldn’t be surprised to see a sub-2,000mAh battery to keep it thin even with the HD screen. Also, if the screen is traditional RGB then you can expect addition energy savings of around 18% over the old Pentile Matrix. It had better not be a Pentile screen. correct me if I’m wrong but isn’t ice cream sandwich going to the 3 buttons instead of 4 ? Yes, but manufacturers may still go for capacitive buttons.. If its running ICS when released then only three buttons would be right. Since ICS does away with the search button. Both the HTC One X and One S only have three buttons. And menu. Back-home-multitask: Those are the ICS buttons. As long as I can get my hands on this after May I am happy. I might wait closer to september though to see what issues come up and see if I can get a tmo VIP discount… But of course this first needs to come out. Man, so many of these mockups look really bad or tacky, and just turn out to be fake. Do people still actually fall for these? I just found out what a brony is a week a week ago. a serious question here. Are most bronies anime fans? I lol’ed.. What’s a brony? What everyone is missing here is that this photo has a physical button in the middle. Why world Samsung put a physical button on a phone when it has been using capacitive buttons on previous models and no buttons at all on the Galaxy nexus. Not to mention it looks very narrow compared to a SGS2. I call fake. The international Galaxy S and Galaxy S II have a iPhone-like physical home button. Oh. Well then if this is real I am not impressed. Me either Tech, me either. If you look closely, you’ll see that it has a Physical home button but inside it, it has a capacitive home button too. Not bad looking, very sharp. I would definitely get this one if it doesn’t have the light blue tint and the battery lasts a full day with no problems! I think the actual phone won’t look like this.. The best rumor about SG3 that I have heard is that it will come with Wireless charging. To good to be true but who knows right? I’m not sure (bezel-less) edge-to-edge glass is a good idea. Just one drop is going to spider web the screen. You could surround this edge to edge glass is a rubber bumper, but again I think bezels are here to stay. Even Apple rims the 4/4S in Stainless steel for this same reason. The brittleness of glass is just hard to get around. Glass is a dense material anyway. Why haven’t we seen somebody do something like the same as optical glasses. PolyCarbonate with like Crizal type coatings. Think about how much that would lighten a 4.7″ super phone. Good argument that it is the actual real mcdeal. If looks cheap feels cheap and runs cheese wizz then it must be a samsung! The “alleged” image isn’t aesthetically pleasing as I’d like. But, I’m drooling over the specs! ! ! I am hoping April, and not the UK Olympics (which I think makes more sense from a marketing – make the biggest splash – perspective). However, SGS II sales are still stellar. So I don’t see why Samsung would want to end a good thing. Then again, if word gets out to consumers that the SGS III is “coming soon” many people will hold off on buying a phone or using that upgrade. That’s what happened with the iPad and iPad 2, sales declined on customers knowing a “new version” was coming out. 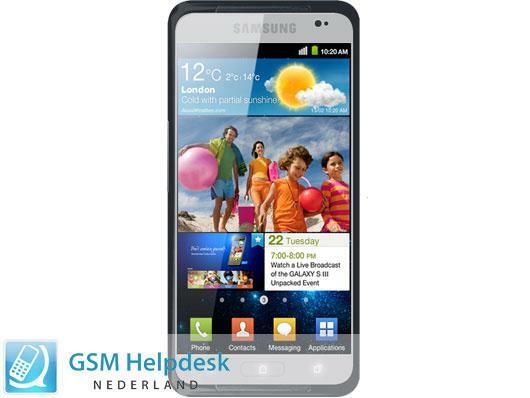 Personally, I have the Samsung Galaxy S II and am going to replace my GF’s phone with it, and buy myself the SGS3. I read on a number of websites that price will be $400 to $450, depending on carrier. I am on with that since I will be buying AT&T’s version and using it on Straight Talk Sim prepaid (where I am getting 4G, unlimited talk, web, data), for $41.66 monthly (if one pays three, six, or 12 months, the monthly price is reduced from $45 if one pays monthly). Hint: Straight Talk’s discount is the same, regardless if you pay for 3, 6, or 12 months. This could be my first Samsuck phone. Seems if I want a fast processor I have to have a retard phone.